I just did a trigger job on my 1st Victory. The trigger turned out excellent. Solid reset and consistent squeeze/break. 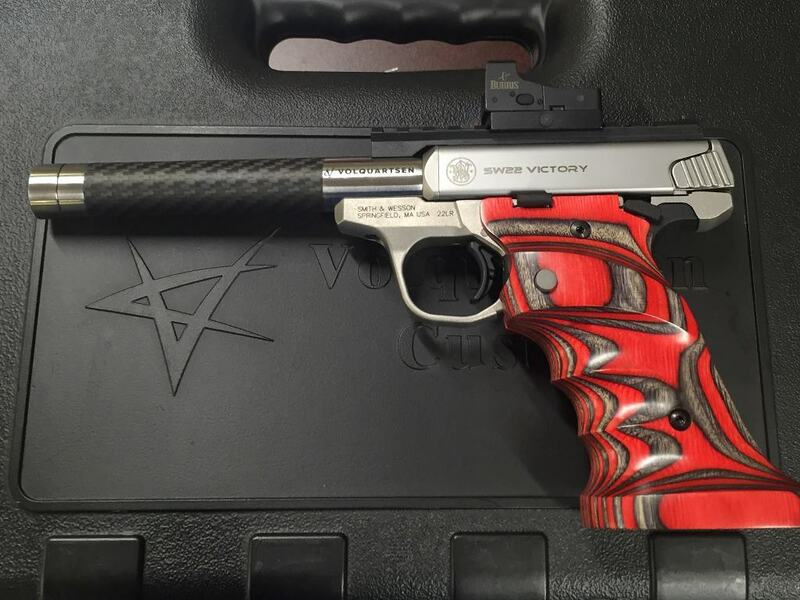 This pistol now has Tandemkross trigger and Volquartsen carbon fiber barrel. Hey Jon look at these. Lots of grips for the Victory. How did the pistol feel to you with the heavier factory barrel? Didn't have it to shoot. I can't imagine it being that much heavier. The Volquartsen was a longer barrel so it's light but not exactly featherlight. I don't think the pistol is worth putting a lot of money into it to maje it competitive. It will still be lacking. The construction of the pistol is light in the first place. That's why Ruger with trigger job is superior. Less money to make competitive. If your going whole hog go Hammerli/Pardini. I finally had a chance to shoot it today. Love the trigger. Very nice job Jon!! I took my 41 along as a comparison, every bit as nice, perhaps better, more crisp. I also do not like the grips, called VC today to see if they will sell me a set of their target grips unfinished so I wont feel so bad filing on them. I weighed the stock barrel, about 4 oz heavier. I put in on, actually like the balance a bit better. Will shoot it again later tonight. I too like shooting my 208s, but the Victory with lighter barrel I too find to be mighty good. Jon says it is too light and yet gets only 10s at 25 yards? Something does not compute. Weight can be added if that is the issue. I wish my 208s was lighter. 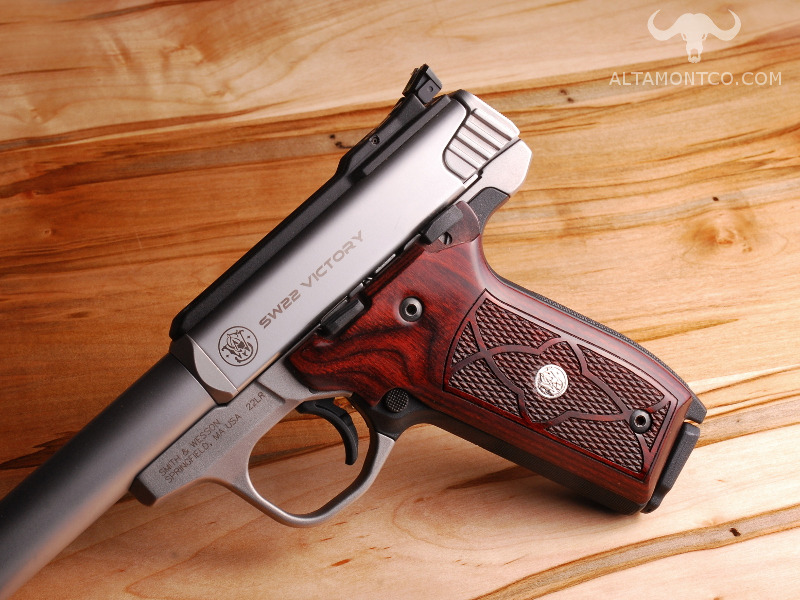 The Victory seems to have pushed Ruger to crafting Mark IV, which has not been out long enough to be evaluated. Of course, the grip has to fit the user, but lots of grips exist. I was lucky, the stock 208s grip fits me very well and the stock Victory is a bit small. Victory is OK as back up. No telling how long my old 208s and three magazines will last. Does not compute? Jon is used to pistols that hold x ring. The 22 match is for running your x ring count up for the high masters. It's easier to score them since you only have to count the rounds outside the X ring. Once again I (and others) have profited from the experience and wisdom of Len. Many thanks. It is a hope that Jon, and/or others of his skill level, will perform a full side by side comparison of SW22 and the new Mark IV. Similar prices. Similar goals (when used for Bullseye). A critical need in Bullseye is the entry of new, younger competitors and for them cost is a significant factor. LenV wrote: Does not compute? Jon is used to pistols that hold x ring. The 22 match is for running your x ring count up for the high masters. It's easier to score them since you only have to count the rounds outside the X ring. I'll be EXTREMELY happy if I can hold the 10 ring with mine. Once I get bored of shooting hundreds, I'll worry about getting grips or getting something else.